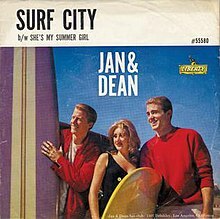 "Surf City" is a song written by Brian Wilson and Jan Berry about a fictitious surf spot where there are "two girls for every boy." It was first recorded and made popular by the American duo Jan and Dean in 1963, and their single became the first surf song to become a national number-one hit. In 1991, after moving to Huntington Beach, California, Dean Torrence helped convince elected officials that the town be officially nicknamed Surf City, USA. In 2006, the official trademark of "surf City, USA" was granted to Huntington Beach after several back-and-forth lawsuits between Huntington Beach and Santa Cruz. As of 2009, more than 65 businesses in the city included "Surf City" as part of their name. The first draft of the song, with the working title "Goody Connie Won't You Come Back Home", was written by Brian Wilson of the Beach Boys. While at a party with Jan Berry and Dean Torrence, Wilson played them "Surfin' U.S.A." on the piano. Berry and Torrence suggested that they do the song as a single, but Wilson refused, as "Surfin' U.S.A." was intended for the Beach Boys. Wilson then suggested that the duo record "Surf City" instead, demoing the opening, verse, and chorus. Wilson had lost interest in the song and believed he was never going to complete it himself. Berry later contributed additional writing to the song, while Torrence also contributed several phrases, but never insisted that he be given writing credit. Hal Blaine, Glen Campbell, Earl Palmer, Bill Pitman, Ray Pohlman and Billy Strange are identified as players for the single per the American Federation of Musicians contract. Released in May 1963, two months later it became the first surf song to reach number one on national record charts, remaining at the top of Billboard Hot 100 for two weeks. The single crossed over to the Billboard R&B Chart where it peaked at number 3. It also charted in the UK, reaching number 26. Before the single, Jan and Dean made music which was largely inspired by East Coast black vocal group records. The success of "Surf City" gave them a unique sound and identity which would be followed by five more top ten hits inspired by Los Angeles surf or hot rod life. The Beach Boys' manager and Wilson's father Murry was reportedly irate about the song, believing that Brian had wasted a number one record which could have gone to his group, the Beach Boys. Brian later told Teen Beat, "I was proud of the fact that another group had had a number 1 track with a song I had written ... But dad would hear none of it. ... He called Jan a 'record pirate'." ^ a b Barres, Pamela Des (1996). "Riding the Wild Surf to Deadman's Cove". Rock Bottom: Dark Moments in Music Babylon. St. Martin's Press. p. 13. ISBN 978-0-312-14853-9. ^ a b Marcus, Ben (2013). Surfing: An Illustrated History of the Coolest Sport of All Time. MBI Publishing Company. p. 92. ISBN 978-1-61058-761-7. ^ Miller, Michael (April 26, 2011). "Two Bites for Everyone". The Independent. ^ Lambert, Philip (19 March 2007). Inside the Music of Brian Wilson: The Songs, Sounds, and Influences of the Beach Boys' Founding Genius. Bloomsbury Publishing. p. 81. ISBN 978-1-4411-0748-0. ^ Preiss, Byron (1979). The Beach Boys. Ballantine Books. p. 16. ISBN 978-0-345-27398-7. ^ a b c Badman, Keith (2004). The Beach Boys: The Definitive Diary of America's Greatest Band, on Stage and in the Studio. Backbeat Books. p. 39. ISBN 978-0-87930-818-6. ^ "Phonograph Recording Contract" (PDF). The Wrecking Crew. American Federation of Musicians. Retrieved June 19, 2018. ^ Whitburn, Joel (2004). Top R&B/Hip-Hop Singles: 1942-2004. Record Research. p. 292. ^ Gillett, Charlie (2011). The Sound of the City: The Rise of Rock & Roll. Souvenir Press Limited. p. 8. ISBN 978-0-285-64024-5. ^ "Songs from Sunshine Plaza Area". Parktunes. Retrieved January 20, 2017.